Suarez in action for Uruguay during the World Cup. And that chance for Okubo was as close as it got for either team. It’s a result that does neither team any favours and makes it likely that both will go out at the group stage. Japan really should be ahead. The ball reaches the unmarked Yoshito Okubo and with the keeper scrambling to cover he screws his shot wide of the target. 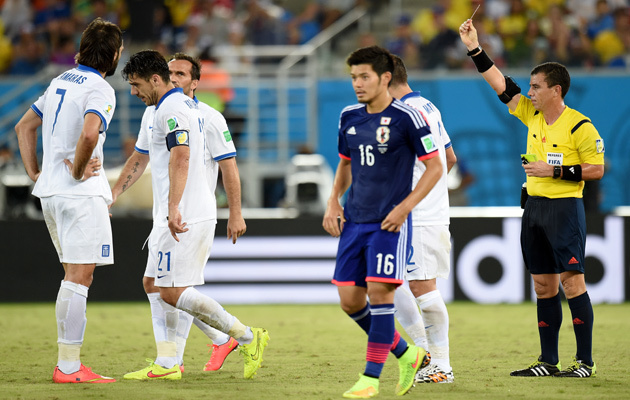 Already booked, Greece captain Konstantinos Katsouranis launches into a risky sliding challenge which he gets wrong, and the referee has little option but to issue a second yellow card. England’s hopes are left hanging by a thread after Luis Suarez punished some poor England defending to lead Uruguay to a crucial 2-1 win. 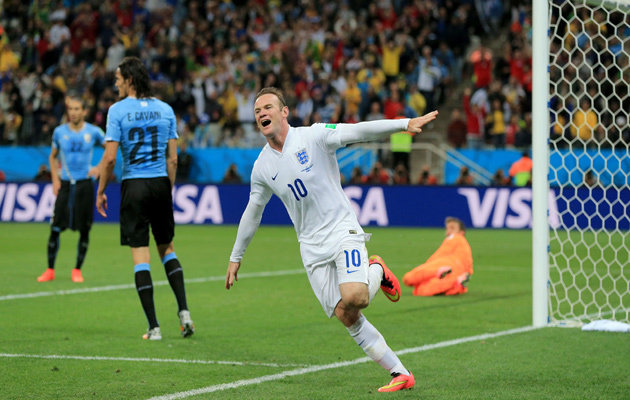 Suarez put his side ahead just before half-time, evading Phil Jagielka to head home a Edinson Cavanni cross, and even though Wayne Rooney broke his World Cup duck to bring England level, Suarez struck late on after being set free by a misdirected Steve Gerrard header. A long ball from the goalkeeper and it skims off the head of Steven Gerrard and into the path of Luis Suarez, who smashes the ball past Joe Hart. Daniel Sturridge does well to set his Liverpool team-mate Glen Johnson free on the right, and the full back cuts into the penalty area before delivering a cross which Rooney taps in from close range. At the other end, Baines advances down the left and pulls the ball back for Rooney whose powerful shot is well saved by Muslera. Cavani should have doubled the lead there. Lodeiro plays him through on goal, but with only Hart to beat the striker fires his shot wide. 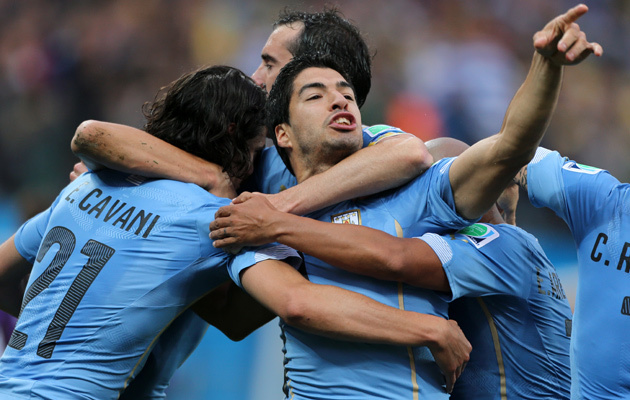 Uruguay lead through that Luis Suarez header. If it stays like this England are out of the World Cup. Against the run of play, Uruguay move forward through Cavani who floats in a lovely cross to Luis Suarez and the striker sends his header past Joe Hart. Steven Gerrard swings in a free kick from near the corner flag and picks out Rooney at the far post, but hi header crashes back off the cross bar. Diego Godin is lucky to be still on the field. Booked earlier for handball, the Uruguayan defender clearly hauls down Daniel Sturridge. It looks a booking, but the referee keeps the card in his pocket. Phil Jagielka’s clearance is sliced into the path of Cristian Rodriguez who has time to line up his shot which sails inches over the bar. Uruguay: Muslera, Gimenez, Godin, Caceres, Pereira, Lodeiro, Gonzalez, Arevalo Rios, Rodriguez, Cavani, Suarez. The World Cup that keeps on giving. Gervinho provides hope to Ivory Coast by dancing past three challenges and shooting in at the near post. Ospina got a firm hand to that shot and will be disappointed not to have saved it. But, let’s not take anything away from Gervinho; that was a wonderful solo goal. Colombia double their lead after a terrible piece of defending by the Ivory Coast gives away possession to James Rodriguez. He draws the last defender before slipping a neat pass through to Quintero who slides the ball into the net. Cuadrado is again the provider for Colombia. This time from a corner, his cross is met by a firm header from James Rodriguez, which Boubacar Barry can only palm into the net. It’s a decent goal but the goal celebrations are even better, with all outfield player running to the touchline to join in a choreographed routine. Just as he was in Colombia’s opening game against Greece, Juan Cuadrado has been his side’s best player. He twists and turns in the penalty area, before unleashing a fierce shot which goes through the hands of Boubacar Barry and smashes against the upright. Let’s be honest, it’s not a classic, but nor is it the type of snore-fest we endured watching Iran play Nigeria earlier in the week. Both teams seem relatively evenly matched, although Colombia on the break look the side most likely to score. The final ball has often been poor and on the occasion the delivery was perfect, Gutierrez missed horribly. Colombia really should be ahead. A sweeping counter-attack and the ball reaches the unmarked Teofilo Gutierrez six yards out. But the striker gets somehow mishits the ball and it screws away for a goalkick. Big escape for Ivory Coast that. 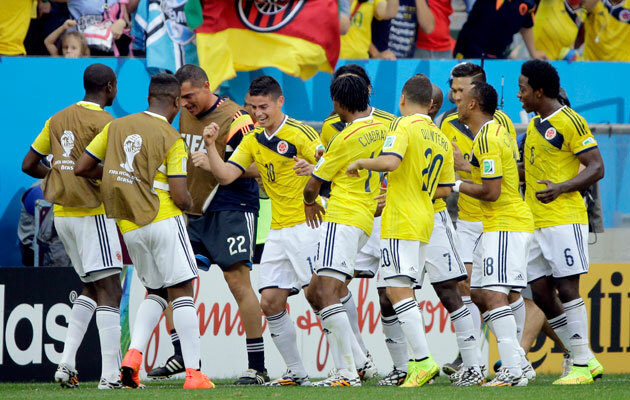 Colombia name the same starting line-up which defeated Greece 3-0 in their opening game. It’s a special day for skipper, Mario Yepes, wins his 100th cap. Didier Drogba must again settle for a place on the substitutes bench, as coach Sabri Lamouchi perseveres with Gervinho and Wilfried Bony, both of whom scored against Japan. Colombia: Ospina, Zapata, Yepes, Sanchez, Armero, Aguilar, Gutierrez, Rodriguez, Cuadrado, Ibarbo, Zuniga. 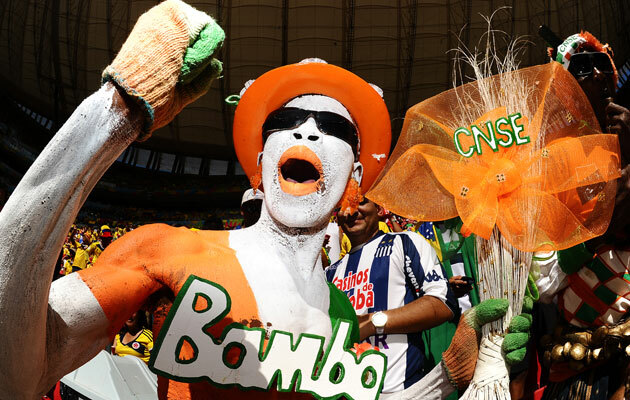 Ivory Coast: Barry, Boka, Zokora, Tiote, Gervinho, Bony, Gradel, Aurier, Y Toure, Die, Bamba. Whoscored.com, who provide an amazing range of stats and infographics over the course of the season, have been producing some handy match-ups throughout the World Cup. Today they compare the strikers ahead of England’s encounter with Uruguay at the Maracana First off, it’s Liverpool team-mates Daniel Sturridge and Luis Suarez and then there’s another comparing Wayne Rooney with Edinson Cavani. Not everyone was sorry to see the holders leave. 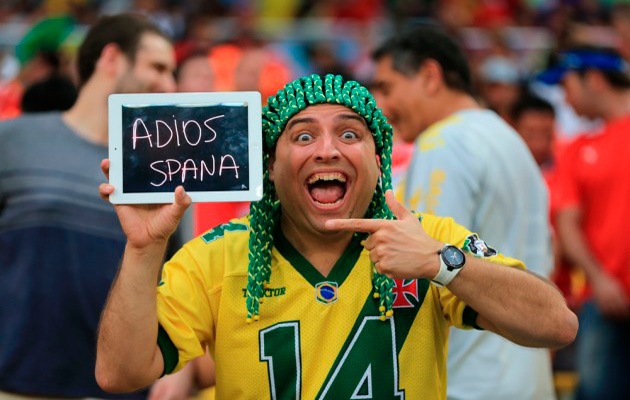 This Brazil fan was delighted to see the back of them. This is one of our images of the day. One of the more intriguing sub-plots of England’s clash with Uruguay later today is the reunion between Uruguay striker, Luis Suarez, and several of his Liverpool team-mates. In particular, his captain at club level, Steven Gerrard, who has been speaking his club colleague in glowing terms. The first teams to be eliminated from the World Cup were confirmed on Wednesday with the departures of Australia, Spain and Cameroon or, as we shall think of them based on their performances in Brazil: the Good, the Bad and the Ugly. Naturally, the big story is the exit of holders Spain and we’ll be bringing you the reaction to that over the course of the day. Ironically, Vicente Del Bosque’s team surrendered their crown on the same day that King Juan Carlos abdicated. Today, there are three more games to look forward to. In Group C, Ivory Coast face Colombia and Japan meet Greece, while in Group D we have a loser-goes-home showdown between England and Uruguay.